On April 25, we celebrate the feast of Saint Mark (died 57), writer of the Gospel, martyr, and follower of Jesus. Mark, and his family, were among the first Christians of the early Church. His mother, Mary, was one of the women who followed Jesus. Mark was present at the wedding in Cana, tasting the water turned into wine. He is likewise believed to be the young man who carried the pitcher signaling that his home would be used for the Last Supper. Later, that same room housed the disciples when the Holy Spirit descended at Pentecost. On this, the dawning of the Easter season, we look to the courageous life of this saint and writer, as inspiration for our Easter journey. Born into the tribe of Levi, Mark was born in Northern Africa (Gyrene, in modern-day Libya), in the small village of Aberyatolos. As a young Levite, he received a thorough education and was able to read and write multiple languages—a skill he would utilize to its full potential as a preacher and writer. His family moved to Palestine following unrest in Northern Africa, and there he encountered Jesus and His disciples. Given his mother’s affiliation and following of Christ, the family was held in high esteem in early Christian circles. Often, many would meet to pray and preach in their home, and Biblical scholars posit family connections to both Saint Thomas and Saint Peter. In fact, when Saint Peter was freed from prison he went directly to the house of Mark. It is believed that Peter himself converted Mark to the faith, and following the Ascension of Jesus, Mark accompanied Peter on his subsequent missionary trips. History tells us that Mark’s first convert was his father, who while allowing his wife to become Christian, had resisted the call himself. While traveling with his father to Jordan, the two men were set upon by a hungry lion and lioness. Mark appealed to Christ, praying, “Oh Christ, Save us!” The lions immediately departed, and his father accepted the faith. To this day, the winged lion is considered the symbol of Saint Mark. Mark accompanied Saint Peter to Rome, likely acting as a secretary and interpreter, and is said to have later preached the Gospel in Venice and Aquila. To this day, the citizens of Venice proclaim Saint Mark as their father of faith, and the most famous of Basilicas in that city is named in his honor. 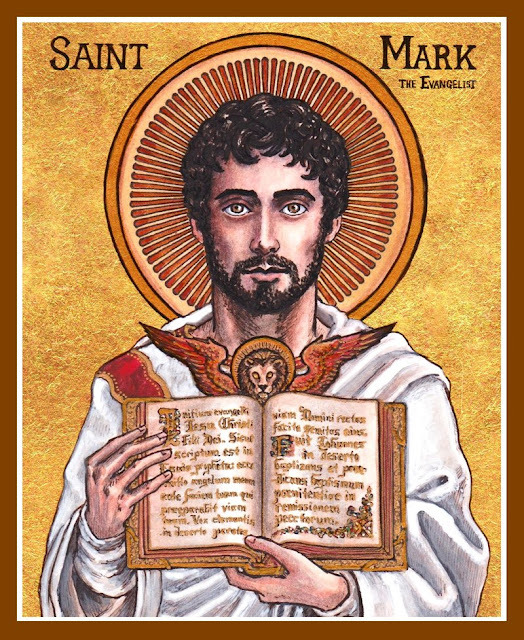 When Saint Peter wrote his First Epistle to the churches of Asia, he affectionately joined to his own salutation that of his faithful companion, whom he calls “my son Mark.” The Roman people entreated Saint Mark to put in writing for them the substance of Saint Peter’s frequent discourses on Our Lord’s life. This the Evangelist did under the eye and with the express sanction of the Apostle, and every page of his brief but graphic Gospel so bore the impress of Saint Peter’s character, that the Fathers used to name it “Peter’s Gospel.” Saint Mark traveled subsequently throughout Lebanon, reaching Mount Lebanon, and serving as the first Bishop of Gobayel. He then journeyed to Alexandria, and is considered the father of the Egyptian Church and the theological school of Alexandria. This school became the center of Christian learning and culture for several centuries. Holy legend tells us that Saint Mark was martyred in Alexandria around the year 57. He was dragged behind a team of oxen, with a rope around his neck, until his holy death. His relics were translated to Venice in 466, although the Italian government returned many of the relics to Egypt in the mid 1900s. Saint Mark was graced with the gift of writing. Through his Gospels, we are revealed many of the small details of the life of Jesus—His words and actions—that other Gospel writers did not record. As his Gospel, the second Gospel, is a vivid retelling of Saint Peter’s recollections, we can be certain that these writings are the intimate and personal reflections of the first pope. The life and service of Saint Mark—as well as the legacy of discipleship and learning he left in Egypt—remind us that we each are called to play our part in the fullness of the Resurrection. What is the Risen Lord calling you to do today? Prayer: Almighty God, who by the hand of Mark the evangelist hast given to thy Church the Gospel of Jesus Christ the Son of God: We thank thee for this witness, and pray that we may be firmly grounded in its truth; through the same Jesus Christ our Lord, who liveth and reigneth with thee and the Holy Spirit, one God, for ever and ever. Amen. O Almighty God, who hast instructed thy holy Church with the heavenly doctrines of thy Evangelist Saint Mark; Give us grace, that, being not like children carried away with every blast of vain doctrine, we may be established in the truth of thy holy Gospel; through Jesus Christ our Lord. Amen.